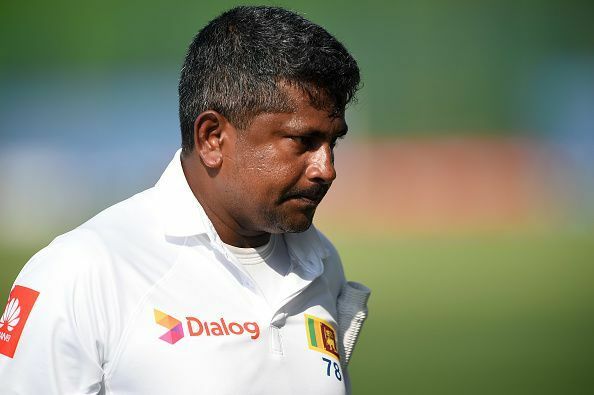 Nagpur, Nov 29: Veteran left-arm spinner Rangana Herath will take no further part in Sri Lanka's third and final Test against India in Delhi due to back problems. Leg-break bowler Jeffrey Vandersay was on Tuesday called up to the Sri Lankan side. Vandersay has played 11 ODIs and seven T20Is for Sri Lanka but is yet to make his Test debut. Left-arm spinner Malinda Pushpakumara was Sri Lanka Cricket's first choice to replace Herath but the 30-year-old failed the fitness test. Meanwhile, Herath is due to fly home on Thursday. "We were hoping that Rangana Herath will feel okay for Delhi. But having spoken to him and physio we feel that he should come back," SLC chief selector Graeme Labrooy said. "We have got lot of cricket ahead and he is important for us. Our plan was to fly in Malinda Pushpakumara, but he has failed a fitness test. Vandersay will now be the replacement," he added. Herath, who is Sri Lanka's leading wicket-taker in Tests in the current squad, bowled a total of eight overs in seaming conditions in Kolkata, but in Nagpur he bowled 39 overs in the only innings that India batted in the second game. He ended with figures of 1/81 but scored a vital 67 in the first match in Kolkata. Sri Lanka drew the first Test before suffering a heavy innings and 239-run defeat in the second. Sri Lanka squad: Dinesh Chandimal (Captain), Dimuth Karunaratne, Sadeera Samarawickrama, Lahiru Thirimanne, Niroshan Dickwella (WK), Dilruwan Perera, Suranga Lakmal, Lahiru Gamage, Dhananjaya de Silva, Angelo Mathews, Lakshan Sandakan, Vishwa Fernando, Dasun Shanaka and Roshen Silva, Jeffrey Vandersay.